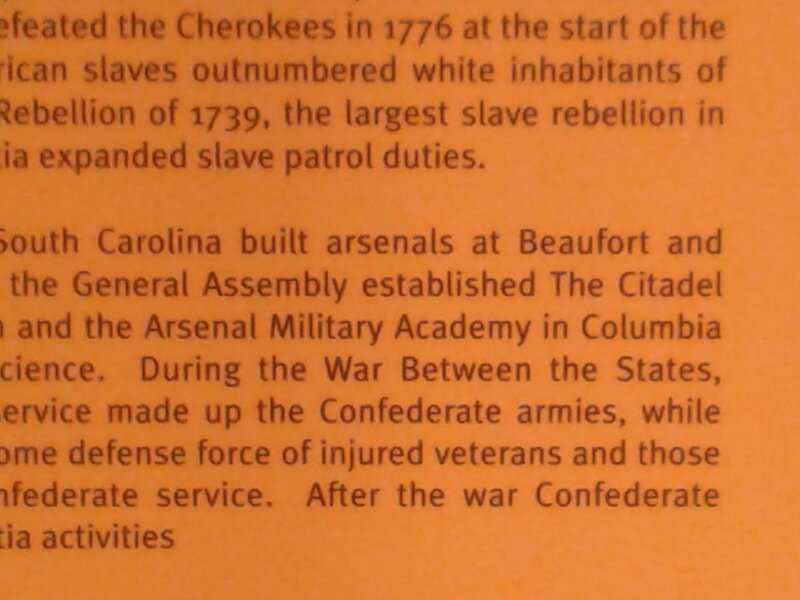 I’m not going to say South Carolina is still hung up on The Civil War, but when your state has a “Confederate Relic Room & Military History Museum” that’s about 95% Confederate Relics and actually occupies the ground floor of a 5,000 square foot building, I think it’s safe to say you haven’t entirely gotten over it. 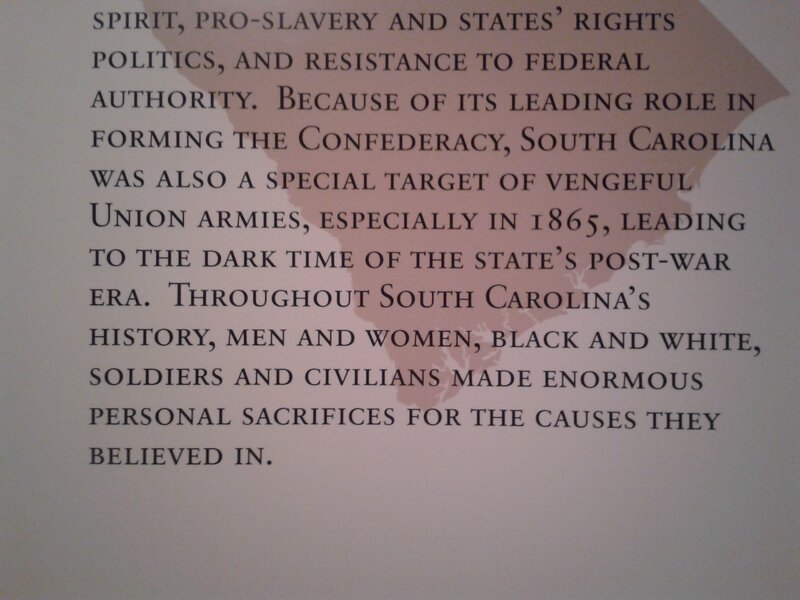 The pictures for today contain an abnormally high number of shots of descriptive plaques and informational panels because I feel they’re necessary to grasp just how far back in the 20th Century much of South Carolina still is and how little remorse or shame they feel for a 300+ year legacy of slavery, segregation and systematic racial oppression, If you’re from South Carolina and would like to argue me on this point, I would say that a) I’m using your state government’s words to illustrate why I’m right and, b) your state capitol still has the damn Confederate Flag floating over it. “Waging a campaign of extra-legal intimidation” is perhaps the most disingenuous description of widespread lynching that one could come up with. 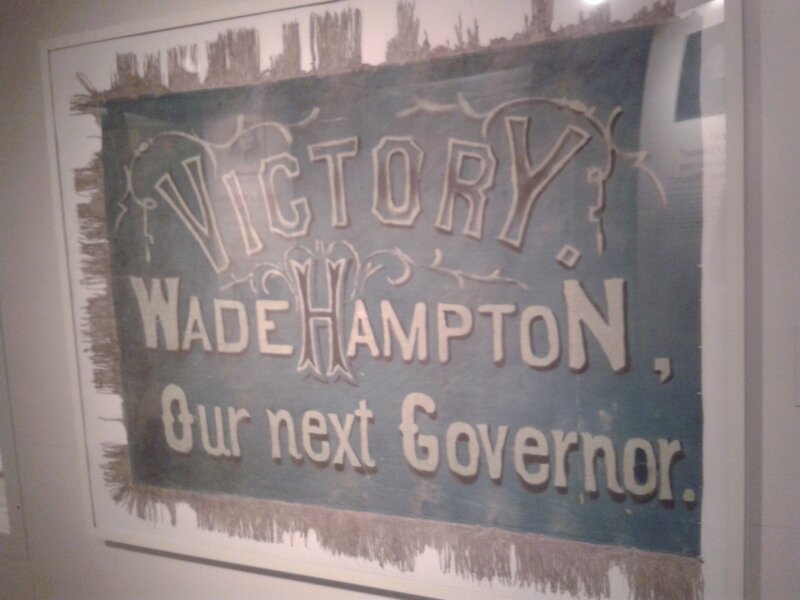 This is a banner endorsing Wade Hampton for Governor of South Carolina in 1876. The museum paints a very favorable picture of Hampton very much in line with his moniker, “Savior of the South.” What they don’t mention is that Hampton’s family owned more slaves than any other South Carolinian family in the Antebellum South and that his election in 1876 came after a bloody and much disputed race between he and his Republican opponent, the incumbent Daniel Henry Chamberlain. As you may recall from high school US history, 1876 was also a year when there was dispute over who won the Presidential Election, the resolution of which came when Republican Rutherford B. Hayes was awarded the Presidency in exchange for our boy Wade getting the governorship of South Carolina. Of course, Wade instantly dismantled the progress in racial equity made by Reconstruction, setting the stage for all the other Southern states to do likewise and eventually give birth to the Jim Crow South. 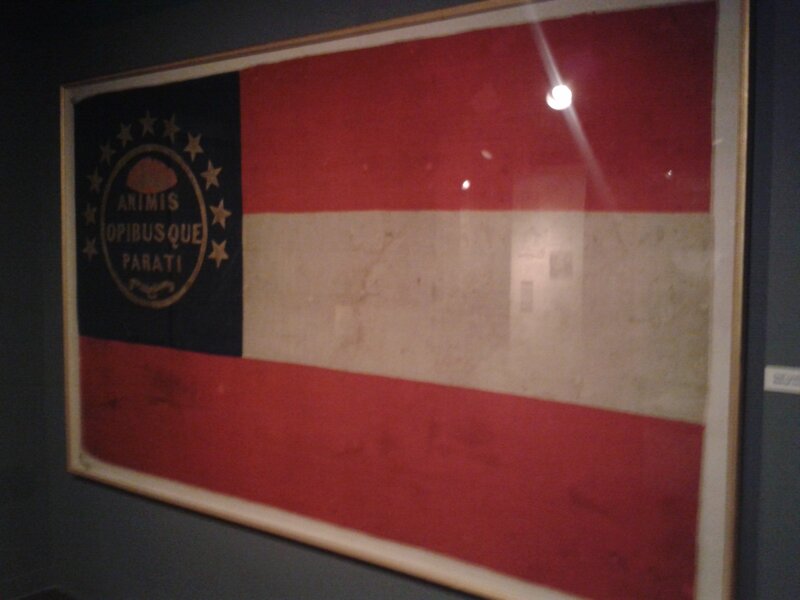 Needless to say, this was not mentioned in the Confederate Relic Room. That’s right people. 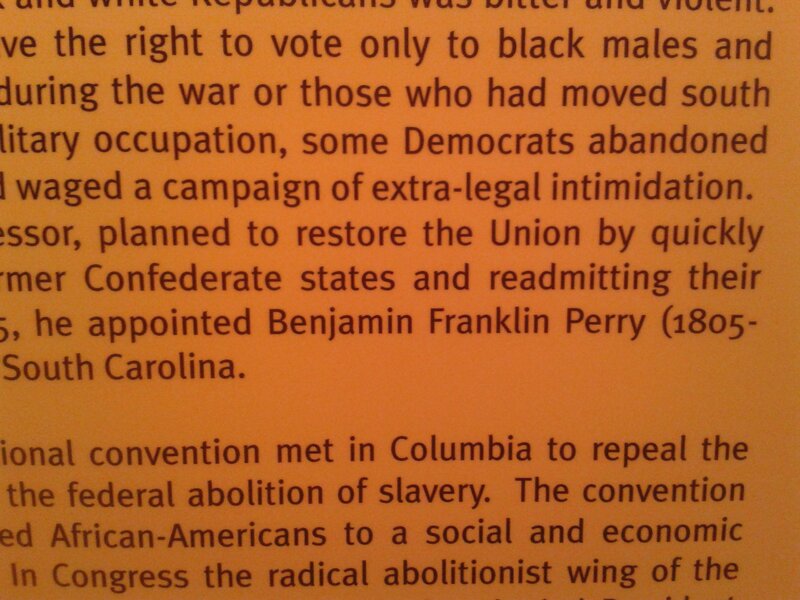 It’s 2013 and a state-run museum is actually referring to The Civil War as, “The War Between The States.” Please excuse me while I go have a good cry.